Mumbai: The criticism about reality shows is abundant but the importance of platform given cannot be ignored. Meri Awaaz Suno was the first Indian Music reality show, which was aired on the then only available channel, Doordarshan. The extremely popular show gave a star like Sunidhi Chauhan. Soon we saw the emergence of the satellite channels era and in 1996 came the first season on Sa Re Ga Ma Pa. Since then, the scene for music reality shows changed forever. Today every popular channel, including regional channels, has at least one music reality show on-going. Needless to add, these shows garn maximum TRPs. For past few years, the amount of criticism these shows receive is too evident, given the drama involved in the show. This however has not deterred the ratings for the show. Below listed are few of the most popular musical reality shows. The pop idol format show was curated in 2004 on Sony Entertainment channel and based on American Idol. The show has given many singers to the industry like Bhoomi Trivedi, Abhijeet Sawant, Rahul Vaidya, Prajakta Shukre and Neha Kakkar. Neha Kakkar is the only contestant who further became one of the judges of the show. Over the ten seasons, the series saw esteemed judges like Sonu Nigam, Javed Akhtar, Sonali Bendre, Sunidhi Chauhan, Anu Malik, and Vishal Dadlani among others. This year due to #MeToo allegations on Anu Malik, he stepped down mid-way of the series and Javed Ali replaced him. The show recently completed its tenth season with much pomp. The winner of the tenth season is Salman Ali. The first YouTube original India, ARRived, is a music reality show on digital platform spearheaded by the maestro A R Rahman alongside Shaan, Clinton Cerejo and Vidya Vox. The show was first aired in the month of November with 13 episodes scheduled. The show stuck with its vision of finding talent sans any drama or sob story. The Stage is the most unique show on television, considering it is the first and only music reality show for Western Music. Aired on Colors, three seasons are completed till now and the fourth is awaited. The Indian Rising Star is the cousin of the international franchise Rising Star. It premiered in 2017 and the third season is on its way. The show also has regional presence like Kannada Rising Star. Shankar Mahadevan is one of the panel members for this show. The first music reality show to begin on Satellite Channel, Zee is Sa Re Ga Ma. The show has loyal fan following. The franchise also diversified in Little Champs edition for kids. For two decades, the show has presented amazing talent. Shreya Ghoshal is one the biggest names to be presented by this show. 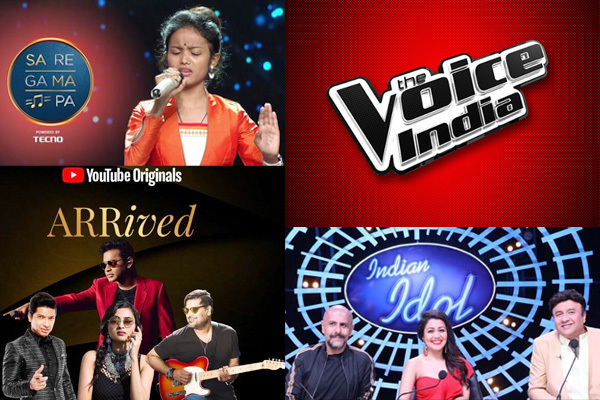 After two successful seasons, The Voice of India is expected to make its third season in 2019. The original series for this show is Dutch and the creator of the same has curated the Indian one.